This year the Norwegian Brunost (brown cheese) celebrates its 150 year anniversary. 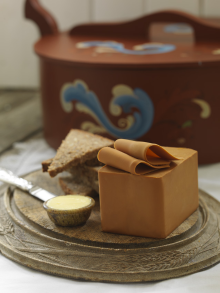 In August 1863, the first Brunost was made by milkmaid Anne Hov on Solbråsetra in Gudbrandsdal. Since then, Ola and Kari Nordmann have loved this distinctly Norwegian dairy product. (article continues) Today, this popular cheese is produced by Tine, and the advertising say that “Brunost make Norwegians Norwegian”. The brown cheese is so important for Norway that it is characterized as a national cultural icon. 30% of all cheese sold in Norway is Brunost. Experts however, would never call this product cheese. Brunost is actually a “waste product” – that is, the cheese is made ​​from whey (Whey is the liquid remaining after milk has been curdled and strained). If you boil the whey and add cream, you get Brunost – or Mysost (whey cheese). The Norwegian brown cheese has been somewhat controversial because of its consistency and color. Most Norwegians use it daily on their packed lunches, while tourists wrinkle their noses. 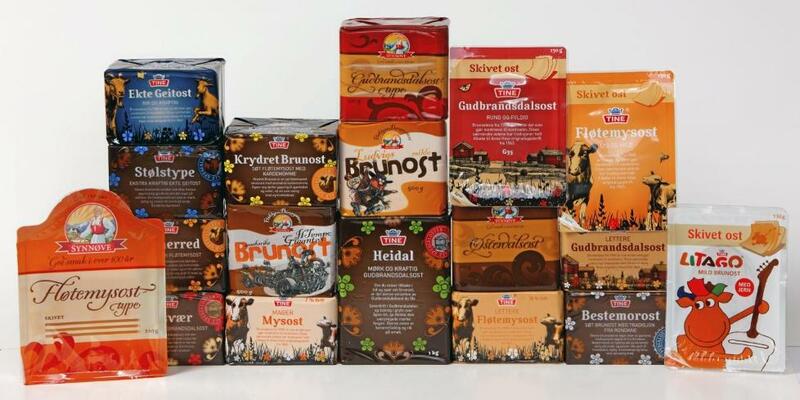 Today you can buy Brunost in many varieties, including Gudbrandsdalsost, Fløtemysost, Bestemorost, Misværost, Innherredsost, Heidalsost and Stølstype. * Earlier this year, a trailer loaded with 27 tons of Brunost caught on fire inside a tunnel in Tysfjord. Four days later, the cheese was still on fire. Firefighters gave up the extinguish work and waited for the fire to end itself. The tunnel was closed to traffic for the following three weeks. Experts explain that Brunost are high in fat, which kept the cheese burning. * In Norway, Brunost is often called “gan-kladd” (“sticky palate”) because it clings to the palate when eaten. * Brunost is often used in cooking, especially in brown sauces. Many serve Brunost to Lutefisk (Tip: Try Bestemorost to Lutefisk – it has a light caramel flavor). * Many Norwegians say that they would have brought Brunost as the only food if they were stranded on a desert island. Going to make some this weekend. Wish me luck.